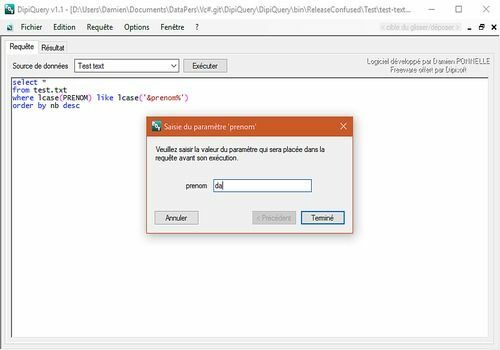 DipiQuery is a small "request" software. In other words, it is a tool that will allow you to write and execute queries on your databases. On all types of databases in fact. Whether it is simple formatted text files, data contained in a Microsoft Excel file, Microsoft Access, dBase databases or more professional databases such as Microsoft SQL Server, Oracle, MySQL, PostgreSQL, DB2, Informix or others, if you install the corresponding ODBC driver (32 bits). DipiQuery is lightweight (the main binary weighs no less than one MB) and portable. However, it requires the presence of a .NET 4. With this unpretentious tool, you will be able to access your databases, regardless of the DBMS, from the same interface. No need to switch from Toad to PgAdmin or PhpMyAdmin (except for administration features) or other tools dedicated to a single DBMS. One last thing: the execution of requests cannot pass through a proxy. Working with existing databases or simplifying the development of a new database, xBaseView is a Windows Explorer-type tool designed for database administrators and novice and advanced users. Database management is not always easy. Beta users will easily get lost, but they can turn to database creation and management solutions like WowBase, which is completely revolutionizing the genre. ECatalogue Pro is an easy-to-use application for creating and managing product sheets and catalogues. It has an integrated database and features essential to the operation of an electronic catalogue. ERBuilder Data Modeler is a free tool that allows developers to graphically design the most popular SQL databases. The simple and fast administration of databases. Native support for MSSQL, MySQL, SQLite, Postgre SQL, MS Access, EffiProz.